Dallas will welcome one of the biggest pop stars in the world with one of a kind artwork created by local student artists. American Airlines Center partnered with Dallas non-profit organization, 29 Pieces, to create unique pieces of art to celebrate P!NK’s return to Dallas on March 24, 2019. “It’s P!NK. She’s a rock star,” said Karen Blessen, 29 Pieces Founder. “Her work and performances are extraordinary. And she’s a mom and wife. 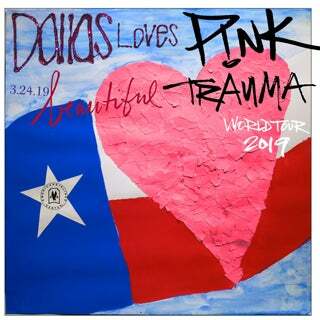 The opportunity for the 29 Pieces team of three young artists to create art for P!NK was unexpected and extremely appreciated.” American Airlines Center will feature the artwork created for this project on social media leading up to the concert, with the chosen piece revealed prior to Sunday’s event. For more information on 29 Pieces, please click here.